New England is a beautiful place for RVers to visit spring through fall. Although New England winters are harsh, any other time of the year gives you a handful of states to travel through including Vermont. Vermont, the second smallest state in America, is the leading producer of Maple Syrup and home to some of the most gorgeous lighthouses on the east coast. Let’s look at five of the best RV parks and campgrounds to park your rig and venture out into The Green Mountain State. 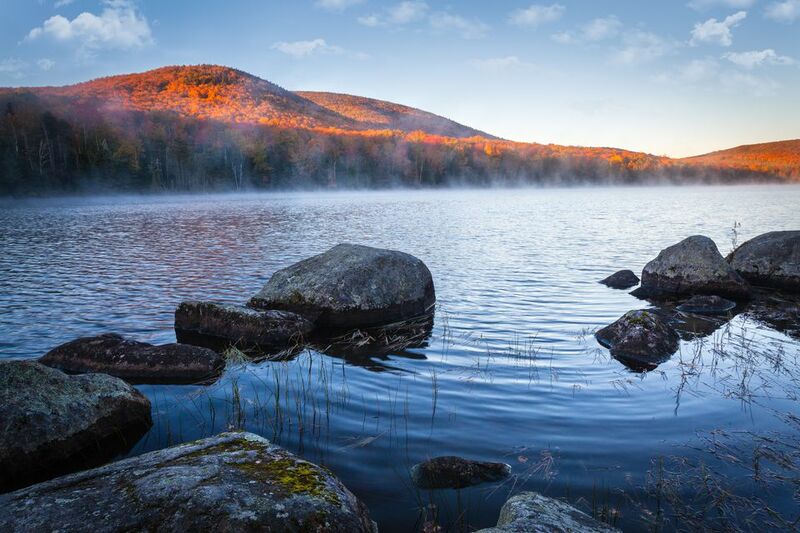 Vermont is the ideal place to while away those long summer hours and Lake Champagne Campground is a great place to start. This relaxing setting offers plenty of amenities and facilities for RVers like full utility hookups along with complimentary cable TV. The bathrooms and showers have recently been remodeled, so they’re clean and tidy. Lake Champagne rounds out its facilities with a rec hall with arcade games, camp store, group pavilions, laundromat, propane refill, and a dog walk. It’s easy to let time fly by at Lake Champagne by relaxing or swimming in their three-acre private lake or play horseshoes on the large open spaces. You aren’t too far from many scenes that you swear are pulled straight from a travel brochure, like covered bridges, cider mills, and public golf courses. You are also an hour away from the Ben and Jerry’s factory in Burlington. You’re on the cusp of boating fun or wilderness exploration when you stay at Waterhouses Campground and Marina. You have your choice of 71 different sites from grassy to the riverfront. Sites come with water and utility hookups, no sewer hookups but there is a dump station at Waterhouses. A camp store contains fishing supplies, groceries and camping supplies like ice and firewood. You also get fire pits and picnic tables and tons of different watercraft rental options. Salisbury is perfectly located to enjoy many different activities in Vermont. Waterhouses itself is situated on Lake Dunmore, and you can rent watercraft to explore it, Branbury State Park is right on the other side of Dunmore and offers many hiking and biking opportunities. You also have the Falls of Lana across the way nestled in Mt. Moosalamoo. The Green Mountains are due east. This KOA is conveniently located in the Pine Valley of Vermont and ready to take care of your needs. You know you’re getting good amenities and facilities with KOA. There are a variety of RV sites offered at the Quechee/Pine Valley KOA, and deluxe sites come with 30/50 amp hookups, water, sewer and cable TV all on a large patio equipped with propane grills, furniture, and a picnic table. The patios house bathroom, shower and laundry facilities to help clean up and are also outfitted with group pavilions, bike rentals, a public use kitchen, and a swimming pool. Head to Pownal where the Berkshire Hills meet the Green Mountains and stay for a whole at Pine Hollow Campground. Sixty sites include water, electric and sewer with cable TV and Wi-Fi available. The Good Sam RV Club highly rates Pine Hollow's clean, modern restrooms, showers, and laundry facilities. You also have camping supplies available, dump stations, group pavilions and more all encompassed by massive pine trees and a spring fed pond. Southern Vermont is an excellent area for outdoors and country lovers. History buffs will appreciate the Bennington Battle Monument, a covered bridge tour or Old First Church, home of Robert Frost’s final resting place. Outdoor enthusiasts can explore Mount Greylock, the top portions of the Appalachian Trail, the Hopkins Memorial Forest, and the Green Mountain National Forest. There’s plenty of quaint shopping areas to explore. Anglers get your rods and reels ready as Apple Island RV Resort is neighbors to Lake Champlain, one of the best freshwater fishing lakes in the country. Apple Island RV Resort will be a great place to start your fishing adventures. Get a lakeside site, complete with full utility hookups. Apple Island is packed with amenities and facilities. There are free hot showers, laundromats, general store, deli, nine-hole 3-par course, community center, fitness center, free Wi-Fi and a marina and dock with access to Lake Champlain. Your primary mode of fun and adventure comes on the waters of Lake Champlain, take a boat out for skiing, wakeboarding or to cruise. Don’t forget that Lake Champlain contains some excellent fishing; you might be to spot Champ, the lake monster who’s rumored to call Lake Champlain home. Other local activities include visiting Burlington by way of the Burlington Bike Path, touring the Vermont Teddy Bear Company or heading into upstate New York for more hikes. Vermont probably isn’t on your RV bucket list, but if you’re in New England, you should stay for a day or two to check out its beauty and uniqueness. It may be small, but it has some sights to see and culture to take in for any traveler.